On the final day of Prime Minister Narendra Modi’s visit, the United States extended its Defence Cooperation Agreement with India by another 10 years. The pact, which was to expire in June next year, will now be in force till 2025. The development follows India’s decision to increase the foreign direct investment (FDI) cap for the defence sector from 26 per cent to 49 per cent. The issue was taken up at Modi’s extensive meeting with US Defense Secretary Chuck Hagel, before the prime minister’s summit-level talks with President Obama at the Oval Room of the White House. The pact, New Framework for the US-India Defence Relationship, was signed in June 28, 2005 by then defence minister (now President) Pranab Mukherjee and his American counterpart Donald Rumsfeld. The Indian Cabinet is yet to approve Rs 15,000 crore worth of US defence deals, including one for sale of 22 AH-64E Apache attack choppers, 15 Chinook heavylift helicopters and the Javelin anti-tank guided missiles. American defence equipment makers like General Electric and Boeing had met Modi a day earlier and expressed their desire to expand operations in India. Defence Minister Arun Jaitley is expected to visit Washington next month for a meeting of the Defence Policy Group (DPG), the top decision-making body for US-India defence cooperation. On the civil nuclear agreement between the two countries, an India-US group is to address all implementation issues for speeding up deployment of American nuclear reactors in India. The agreement on this had hit a roadblock in 2010, when India rolled out a nuclear liability law. For his summit talks with Obama, Modi drove straight from Blair House, where he was lodged, to the famous West Wing of the White House. The talks were first in a restrictive format and later at a delegation level. In terms of actual business transaction, Nuclear Power Corporation of India is in talks with GE and Westinghouse to kick-start the agreement. 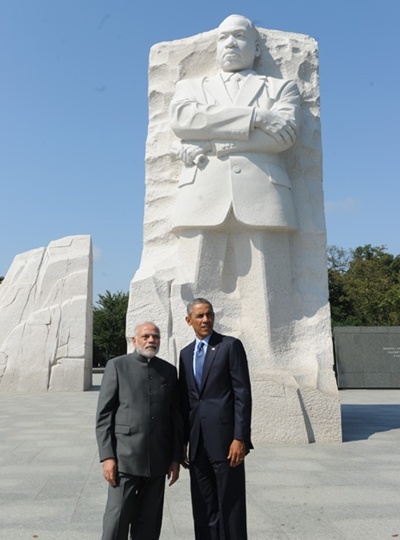 This was Modi’s second meeting with the US President since taking charge as India’s prime minister. On Monday, the two leaders had discussed bilateral issues over a private dinner in an informal setting. The body language of both leaders looked relaxed after delegation-level talks, with Obama sipping a drink occasionally and Modi wearing a constant wide grin. After the meeting on Tuesday, Modi took everyone by surprise by addressing the media, jointly with Obama, in Hindi. During his visit to the US, the prime minister had earlier addressed the United Nations General Assembly (UNGA) in Hindi. On economic ties, Modi hinted that the government was going for further economic and policy reforms that would help in “rapid growth” of bilateral trade and investment partnership.Both sides discussed the recent standoff over the World Trade Organization’s (WTO’s) trade facilitation agreement (TFA). Modi revealed he had frank discussions with Obama and expected the US’ support in addressing India’s concerns over public stockholding for food security. In a definitive step, Modi also sought easy access for Indian services firms in the American market.